I bought Rainier cherries at Costco yesterday. A tag on the package says they were picked on June 17 and are from Yakima, Washington. Not too many packages are left, but lots of Bing cherries are available. I don't know if the Rainier will be restocked. If you want them, I would buy them now. I've been tempted to buy the Rainier cherries in Costco for several years but haven't. I am positive I did this because of the fabulous blog post on Teresa Blackburn's "food on fifth" blog. It's worth clicking over to her blog just to see the photos, but the recipe for Rainier cherry galette looks great too. 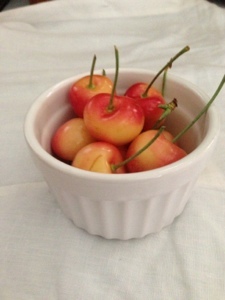 I don't have plans to cook the cherries, very tasty uncooked - nor super sweet, nor super sour. Ranier cherries are the best. They manage to get cheaper once a year. Thanks for the shout-out about my blog post. Much appreciated. Love the cherry photo you took. Thanks, Teresa! This picture is totally due to the class I took from you!